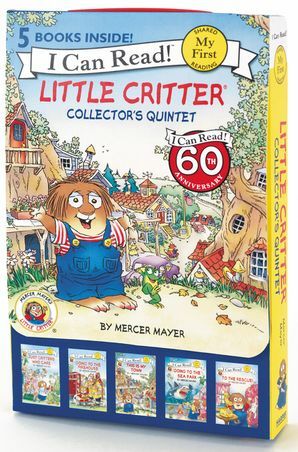 Join Mercer Mayer’s classic and beloved character, Little Critter®, as he visits the sea park, explores his town, helps out his neighbor, and more! With five fun-filled My First I Can Read stories in one box, this quintet is perfect for shared reading with a child. The Little Critter Collector’s Quintet comes in a carry-along case with a Velcro closure and plastic handles, ideal for story time, anytime. Includes five Little Critter books: Critters Who Care, Going to the Firehouse, This Is My Town, Going to the Sea Park, and To the Rescue.